When we first got our hands on this delicious, mulberry-colored sateen, we knew it had to be a dress. The only question was, what kind? Suddenly it became very clear. I (Melinda) have always wanted to make a one-shoulder dress with a huge bow, and this seemed like the perfect opportunity! To spice things up a bit, I made this dress high-waisted and added a quarter-circle panel in one side seam. I also put a small band across the panel to keep it mostly in check. Then I gathered the panel to the band; the result is a very luxurious, gathered detail that bursts forth just above the knee and cascades to the floor. Iwas so excited about this dress that I set to work immediately. It went together easily, something our dresses don’t always do, and by the end of the day I knew it would be a winner! 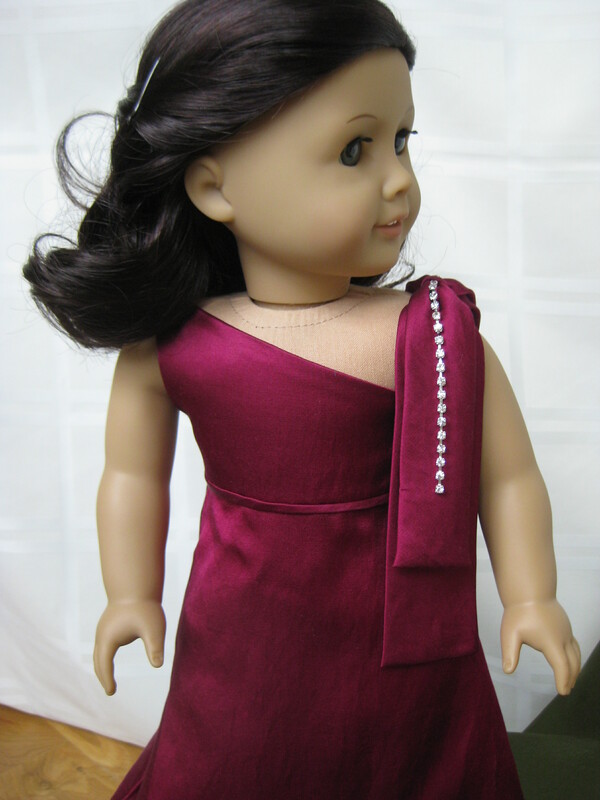 Then, Melody suggested adding some bling — after all, Sophistication 2010 is eveningwear! So when we hit the fabric store looking for trim, I realized this would be perfect time to try out the super-sparkly rhinestone trim I’d always wanted to use somehow. 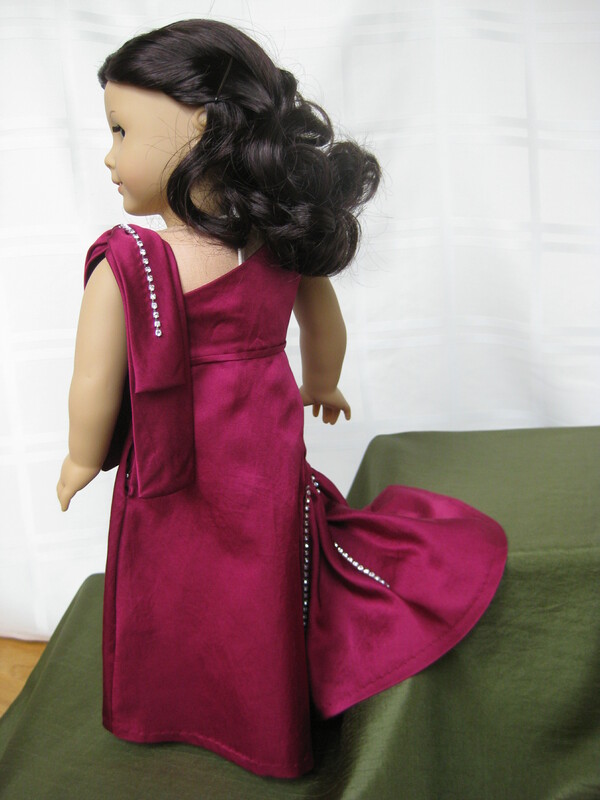 Melody put some across the shoulder bow, then placed three strands dripping off the band at the side seam. Voila! and a dress perfect for a socialite was born! This and the Hostess dress are my favorites! 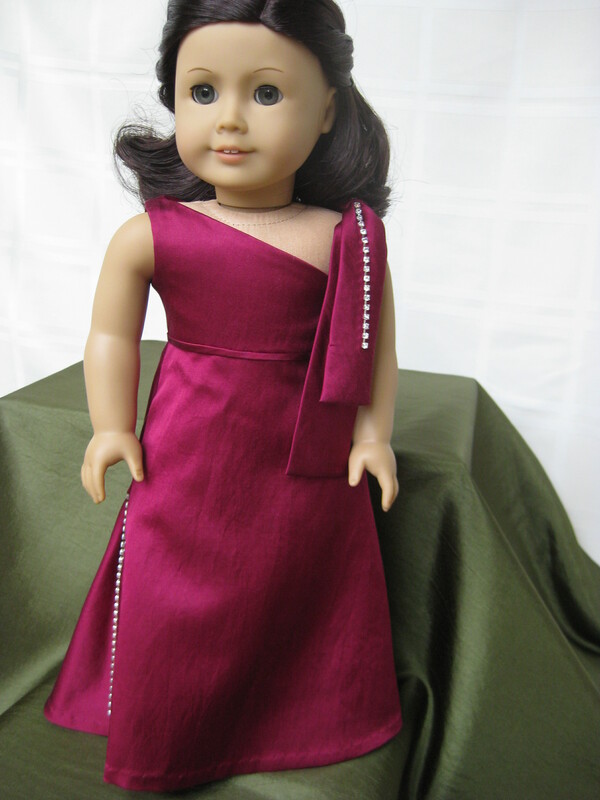 The mulberry color of this dress and the strands really exhibit the true colors of Christmas. The one-shoulder bow is fantastic!